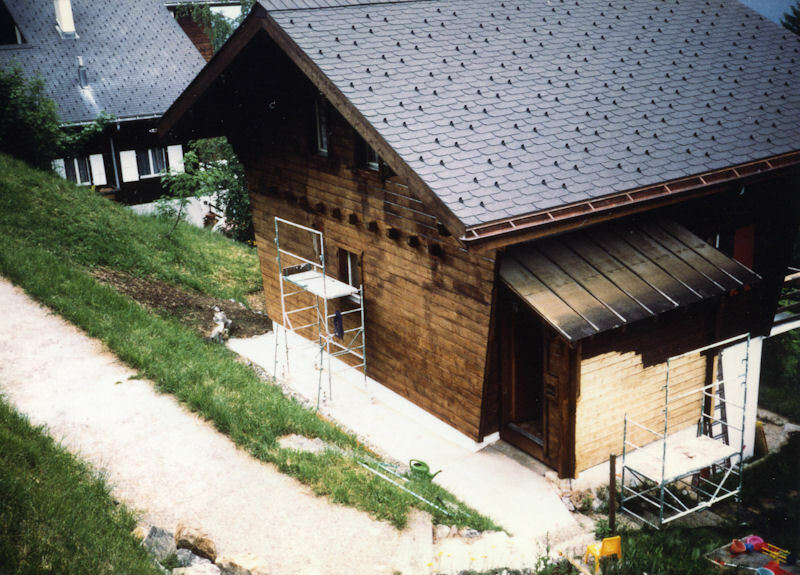 Here are some poignant pix of Chalet Pollux in Leysin, Switzerland, during and after its first, and just before its second major face-lift. 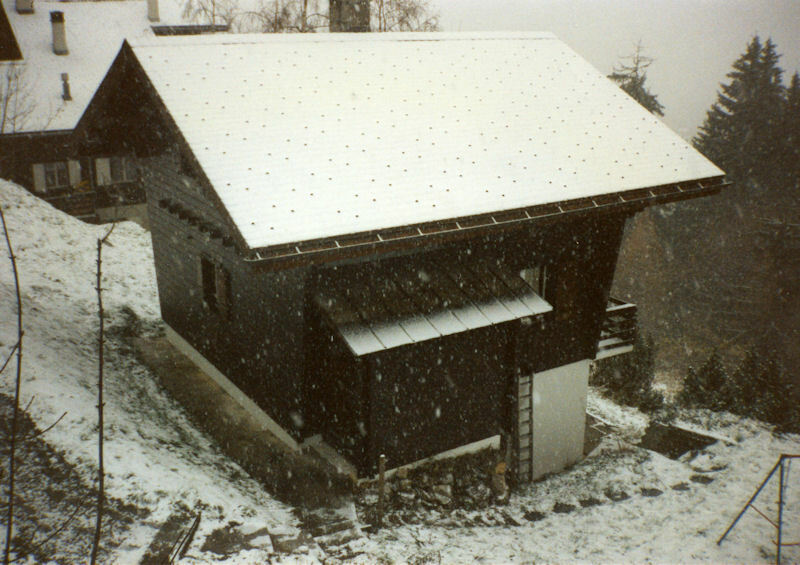 Here's Chalet Pollux in Leysin, Switzerland, in 1992 -- a short way out on the Leysin American School road at the southern edge of town, across from the Solacyre skilift. 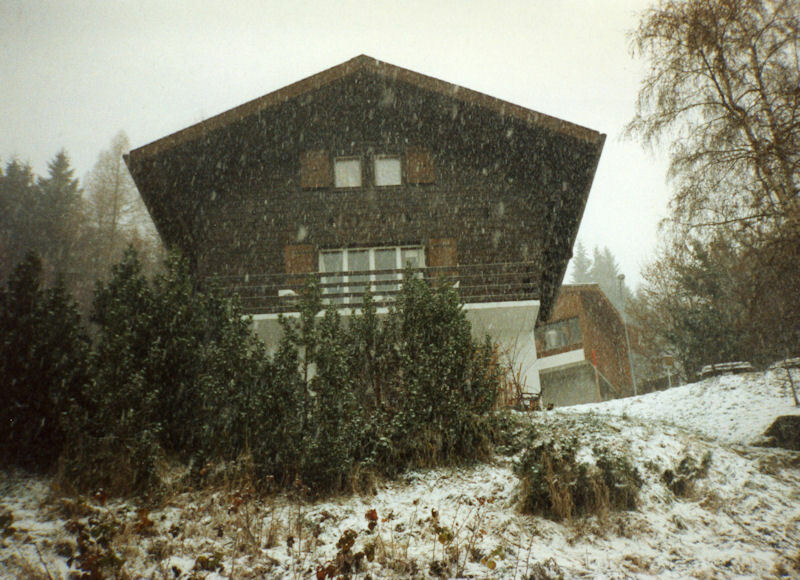 Built early on as one of two identical, cheap vacation houses (the other, of course, was Chalet Castor [left], named after the Gemini twins), Pollux was the home of many of the great Leysin mountain climbers, even in the then-unfinished basement. 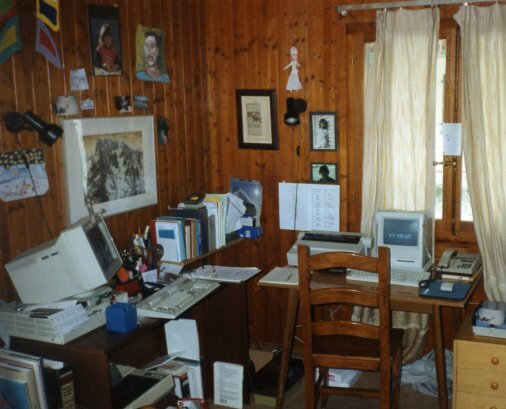 When gobbled off the market by Mr Peck and Ms Wilson in the mid-1980s, Chalet Pollux did not look like this. In fact, it required a big face-lift! Small, but elegant. 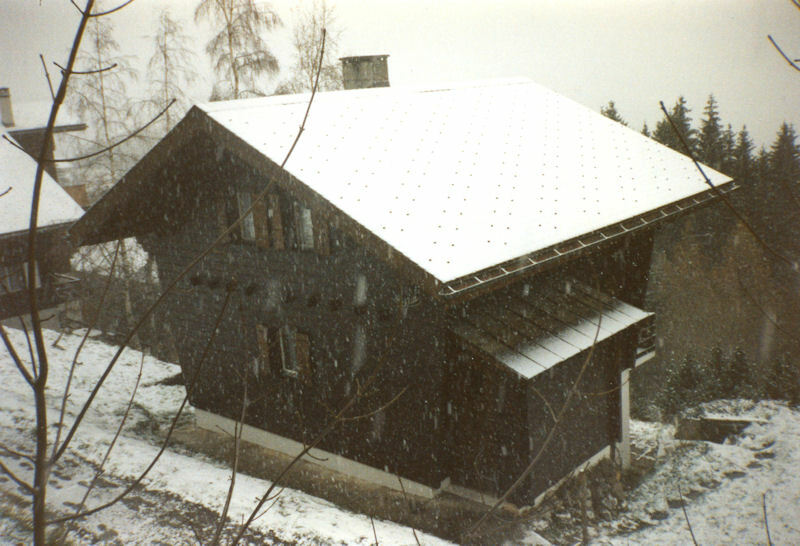 Sadly, this is a photo taken in 1992 to be posted in the office of the real estate agent in order to sell it, displaying neatly its new roof, supplied by Leysin's Werner Standke, the nice stairs down the side of the building supplied by Mr Peck himself, and the shiny resurfacing of the wood, also supplied by Mr Peck, and just in time, too, since about an inch of outer surface had rotted to powder since the last maintenance on the house. 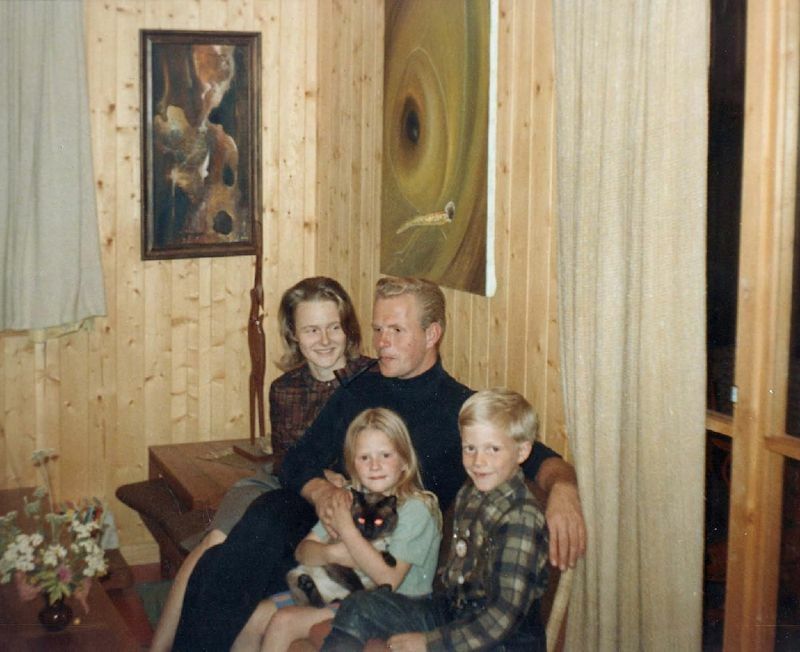 Three tiny bedrooms up under the eaves, and a livingroom, small kitchen, and bath on the main floor, with a detached studio in the basement, home first of ACS Prof. Erik Knudsen and later home of our favorite neighbor/hiking partner Carmen. 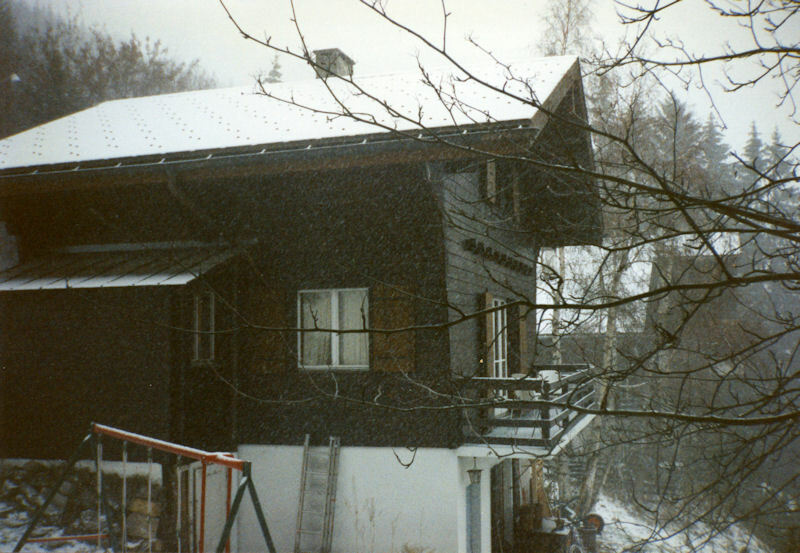 But this is not how we found Chalet Pollux in 1986. 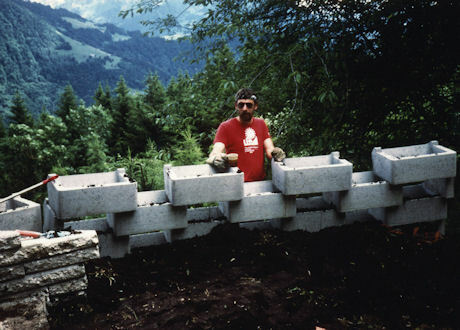 In 1986, Chalet Pollux was a Fixer-Upper! 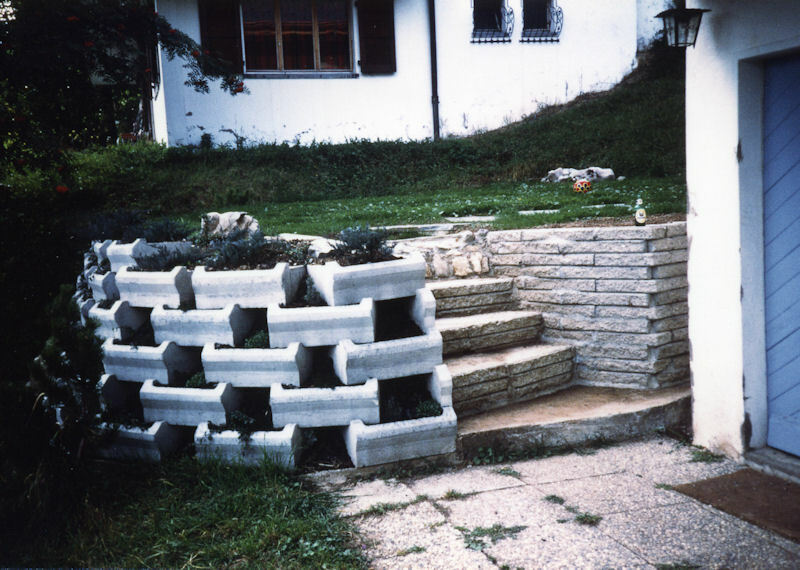 For example, a new terrace on the side -- the photo on the left shows the Grade 3 dirt being freighted in laboriously to lay a base for the Grade 2, and then finally the Grade 1 dirt to make a nice new lawn. 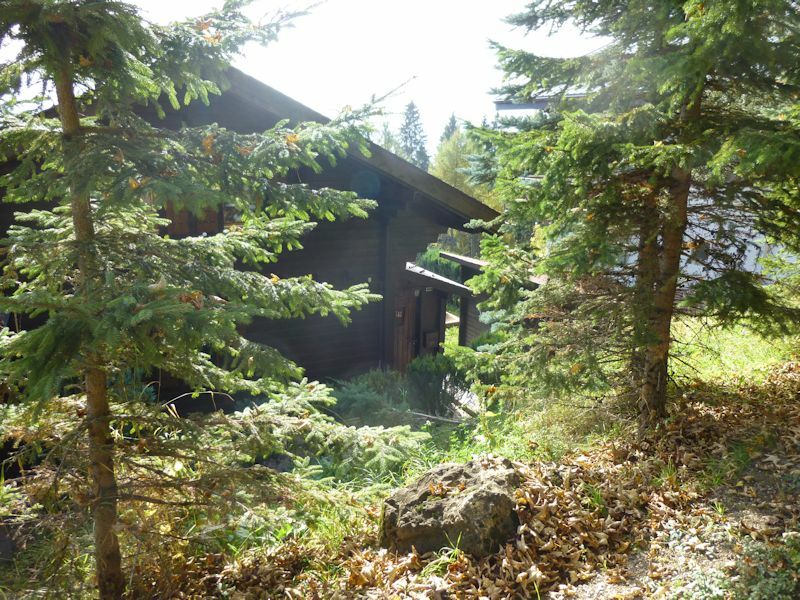 The photo on the right shows what's under the Grade 3 dirt -- yes, that's the old roof. All smashed up. Those delicate expensive little rooftiles were smashing themselves up on the roof anyway, many of them having to be replaced every year, so now they've found a more permanent home under the Grade 3 dirt. Just as we all will, one day. Nice new terrace, before the vines have grown in the planters but with some good grass growth on the shards of former roof. 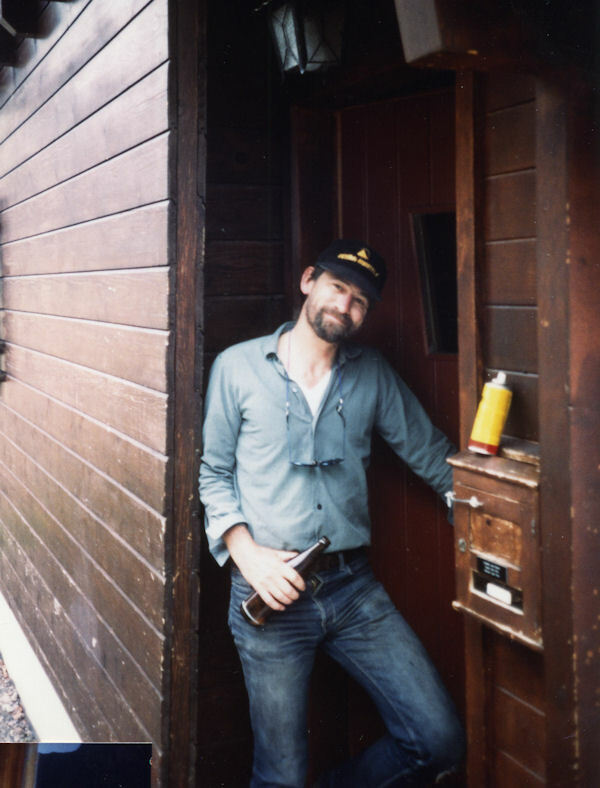 Taken in 1988. 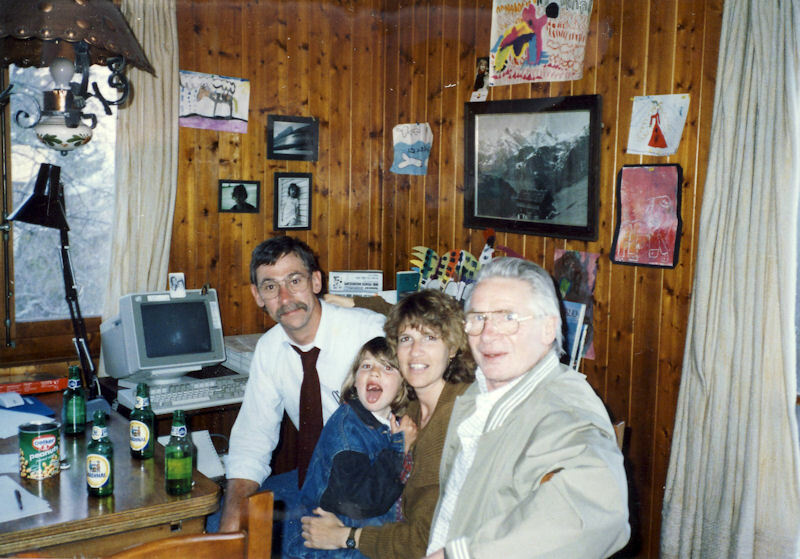 And, as Marlowe (in 1988) points out, no more old bathroom. No new bathroom yet either, but that's coming soon and there's a bucket in the corner. And a thorough facelift on the outside, crumbly old walls rotting away to palimpsests. 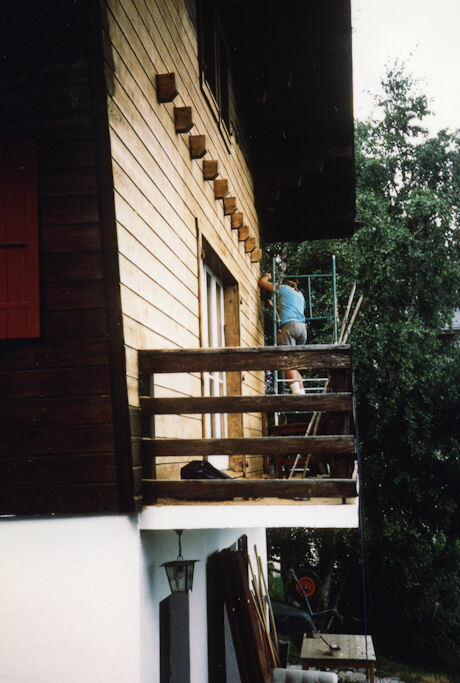 A good sanding down and then two coats of stain, and some artful renovation of the window shutters as well. 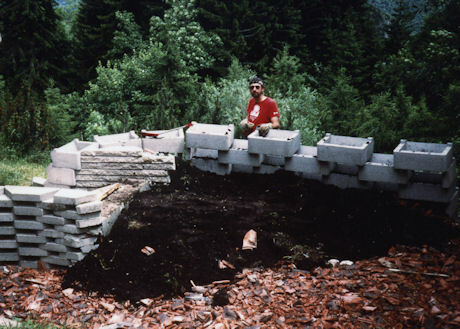 Many homeowners will understand the temporary but very strong attractions of the home improvement addiction, and one hopes that they too will get over it eventually. Mr Peck pauses in his labors to reflect upon where this is all going. But he didn't guess the worst. A little more sanding, a little more staining, a pleasant feeling, toiling away at fortifying the family nest, so to speak . . .
With suitable refreshment from time to time, of course. Work work work. 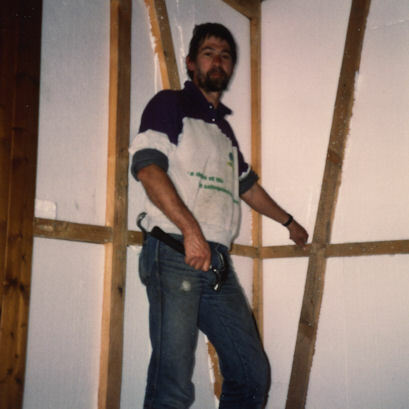 Walls back up after a thorough reinsulating behind the paneling. 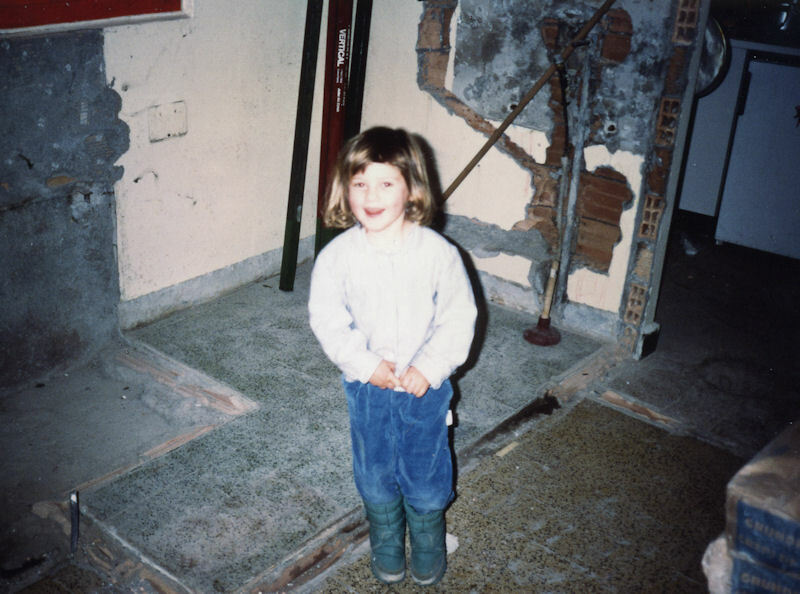 Back to 1992, small house for a family but too big for one person, so regrettably bye-bye. 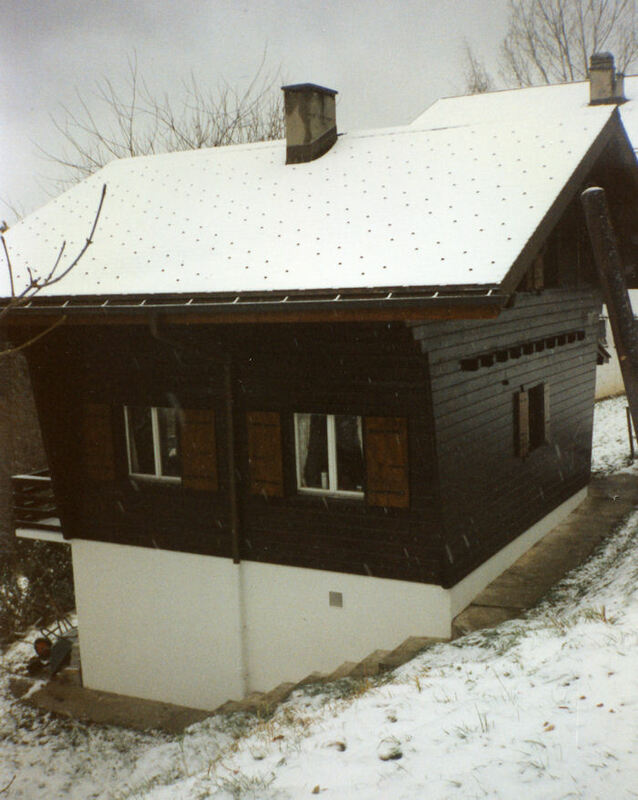 The successor family, very nice people from Fribourg, bankers or something, took the cozy house firmly in hand and tripled its size with add-ons and big arches and new facilities for the in-laws and a car-port at the top of the hill, and it really doesn't look the same anymore. But we hope they're happy there. 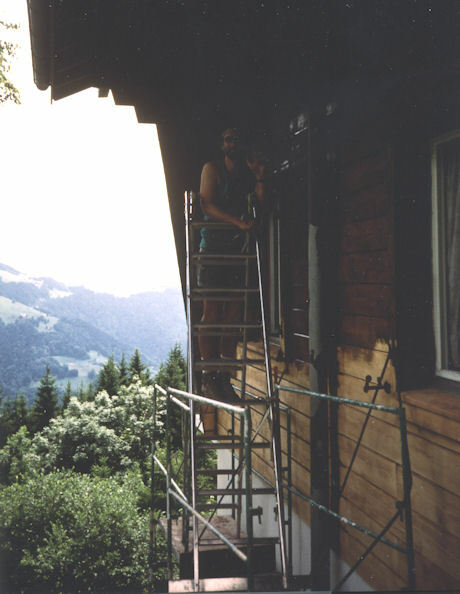 From Chalet Pollux, Marlowe departed in late 1991 for her mother's house in Vufflens-la-Ville, and Mr Peck himself moved to Gimel at the end of 1992. To where? 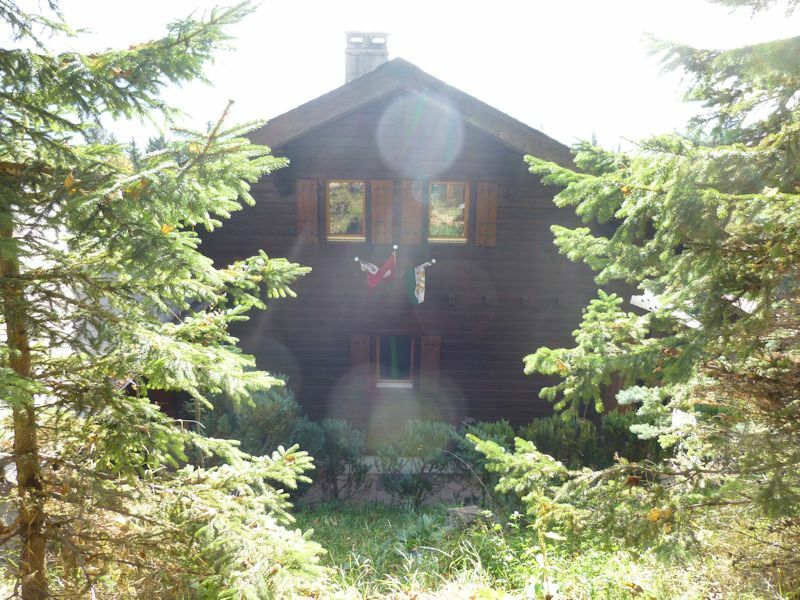 To Gimel. 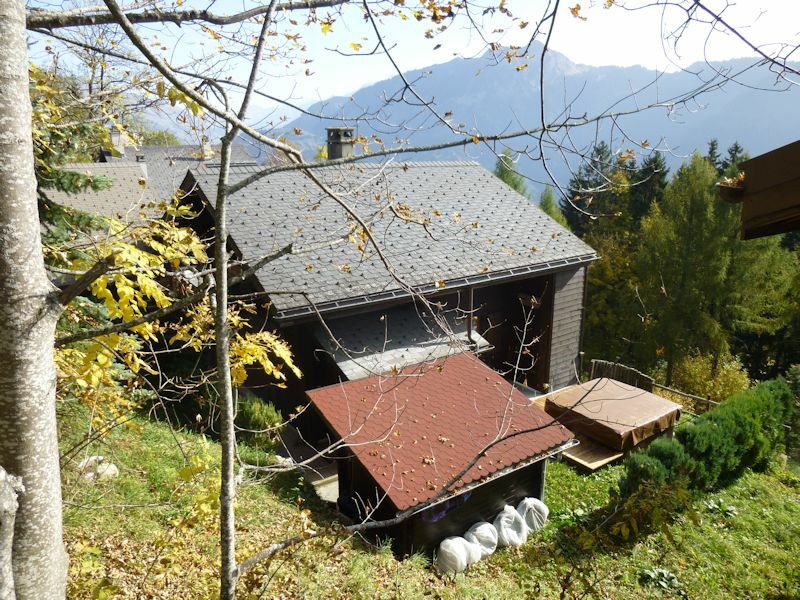 We're visiting Leysin in October 2012 with Marlowe and one's grandson William, and Chalet Pollux is holding up very well, it seems. There were no trees here, however, when we left the scene. 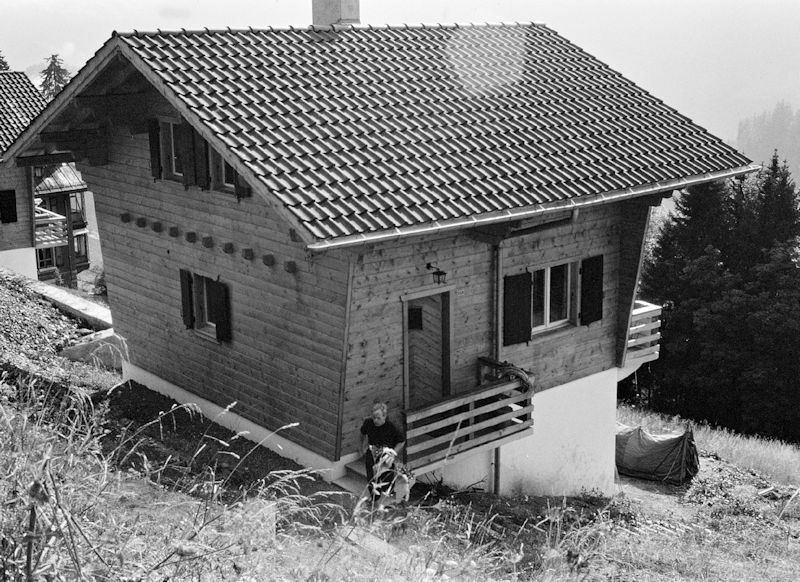 The famed mountaineer John Harlin and his family lived in Chalet Pollux in the mid-1960s, at the time when he and his colleagues were making Leysin a mecca for English-speaking climbers (note tents on the back patio). 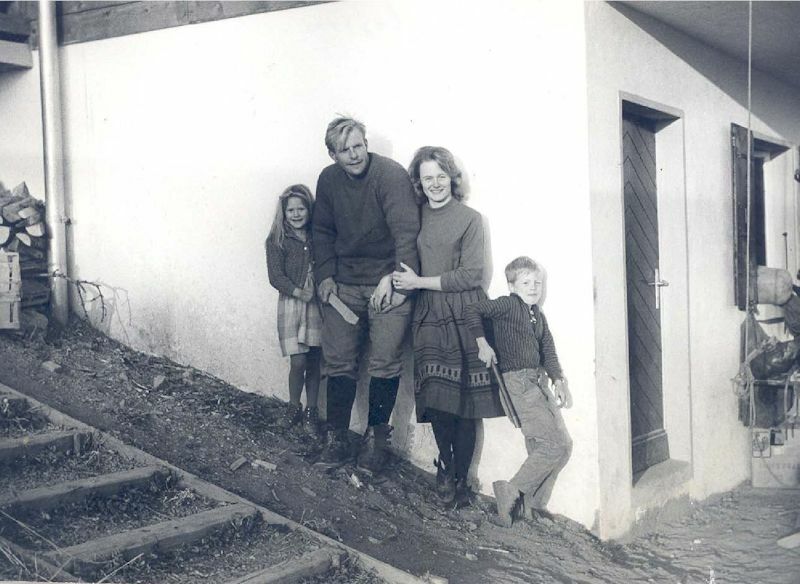 John Harlin died tragically in 1966 on the "Harlin Direct" climb on the Eiger Nordwand, but son John says that they all loved Chalet Pollux and he still remembers it very fondly. Feedback and suggestions are welcome if positive, resented if negative, . All rights reserved, all wrongs avenged. 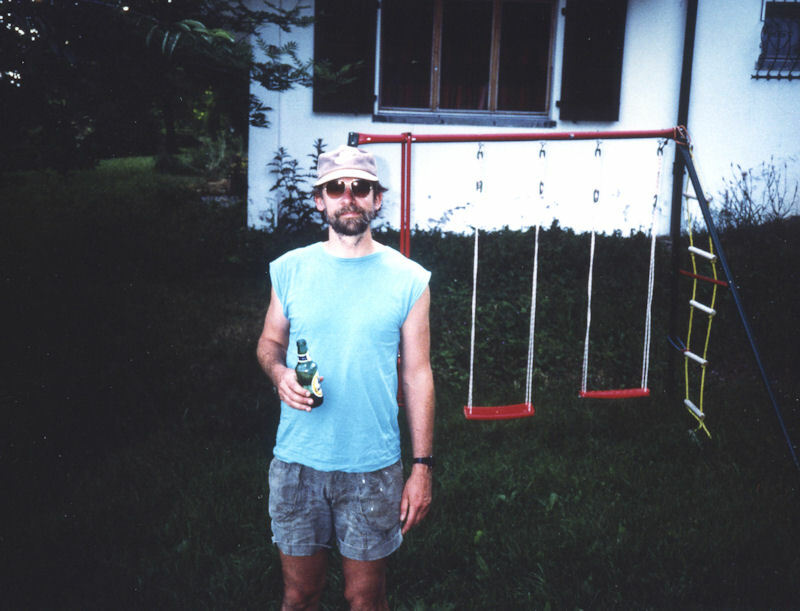 Posted 13 March 2002, revised 11 February 2015.